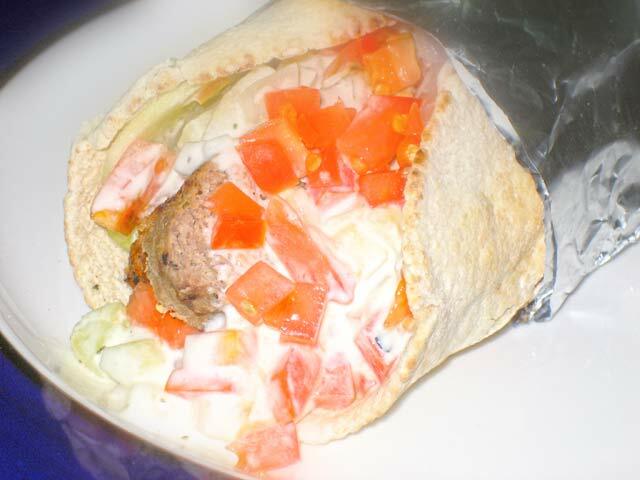 Gyros are a very delicious food that has meat, onions, tomatoes all topped with Tzatziki Sauce. The meat is placed on a vertical spit and it is rotated in front of a fire rack. Where I live there are not many places were you can get a good gyro, so I had to learn how to make my own. It turns out it is not that hard to do once you know how to season the meat. You can even make it in your oven, since most of you will not have a spit or a rotisserie. My brother ate gyros yesterday, and he asked me If I had a good recipe. “Of course!”, I said. Here you have my family approved gyros recipe. Chop the half of the onion and the garlic in a food processor. Add the meat, oregano, marjoram, black pepper, and the salt and and blend until it forms a smooth paste. Form a square shape with the meat and place in a ovenproof glassware. Preheat the oven to 350F. Cook the meat in the oven for 15 minutes. Turn the meat over and cook for 10 minutes more or until the meat is browned. Cut the meat into 1/4 inch thick strips. Dice the remaining half of the onion. Dice the tomato. Peel the cucumber and slice in half. Slice into thin strips one half of the cucumber. Place about 6 slices of cucumber over the pita bread. Add several strips of cooked meat. Add a several spoonful of diced tomatoes and diced onion. Cover with two o three tablespoons of tzatziki sauce. Fold the pita bread into a roll and wrap in aluminum foil. Edit — I recently tried this recipe with ground pork, and I think it tastes better than ground beef. Add the yogurt to a mixing bowl. Core the remaining half of the cucumber. Dice the cucumber and add to the bowl. Finely mince the dill and the mint. Add the relish, dill, mint, and garlic powder into the bowl. Mix all the ingredients. Salt according to taste. The sauce tastes better when you let it rest. This lets the ingredient flavors blend.